We will enter into this season of thanksgiving and gift-giving with great gratitude and generosity. Let’s be like the people written about in Psalm 107:20–22 (ESV). He sent out his word and healed them, and delivered them from their destruction. Let them thank the Lord for his steadfast love, for his wondrous works to the children of man! And let them offer sacrifices of thanksgiving, and tell of his deeds in songs of joy! God has been so good to us! All who have repented and believed in Jesus have been completely healed by the grace of Jesus. We no longer live under the tyranny of sin. Jesus has paid in full the price of our sin. We are no longer under condemnation. Jesus paid it all! We are now free to live in obedience to God’s Word and enjoy the blessings that come to those who trust and obey Jesus. There is nothing we could do or offer that could ever give God any reimbursement for what He has done for us. We have nothing to offer Him other than praise and thanks. When we hold back our expressions of gratitude, the deep enjoyment of our thanks is limited. When we express our gratitude with word and action, the enjoyment makes the genuine appreciation all that more enjoyable. During the months of November and December, we receive the Gift for Christ. This gift is extremely important because it allows us to send our people to the countries where the Gospel is needed and where our missionary partners are serving. We will continue accepting gifts through the end of the year. Please give generously out of a heart of gratitude and pray about being sent next year to serve on mission with our partners. These blessings will be many and you will discover, as you have heard many share recently, that the blessing comes to those who give and go. 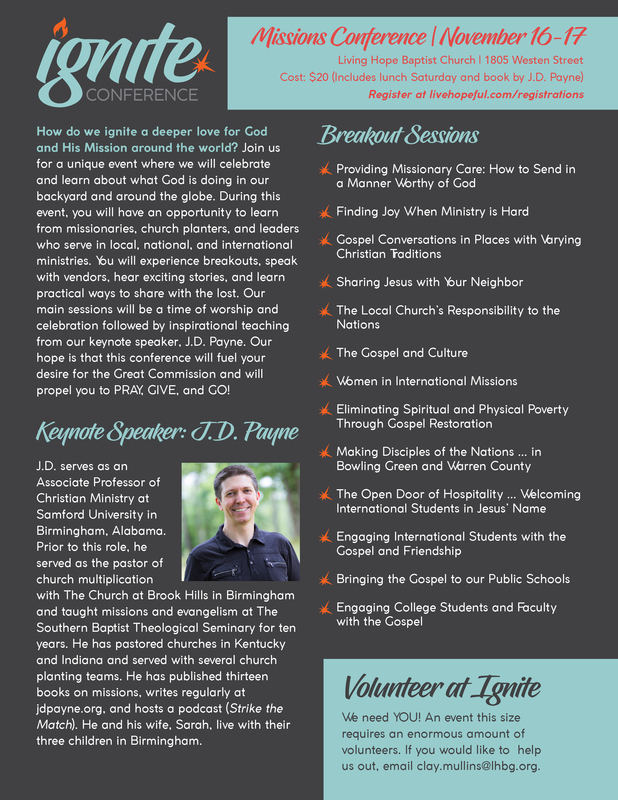 One more thing, be sure and sign up and attend our mission’s conference, Ignite! Our partners will be here from all over the world to share inspirational stories and explain how we can be a part of what God is doing in their country. There will also be other inspirational speakers that will help us understand the joy of living on mission. You can sign up here.